Throughout the long history of mankind, an essential part of human nature has been the development of a variety of different forms of verbal languages. The common link between all of these language is the fact that they all use words and combinations of words, and their meanings. Words are necessary to convey meaning, but not infrequently they may obscure the sense. And by using words we always live through them, making our way in the realms of the senses, reliably isolated and protected from ourselves by a fence of words. Words consist of sounds, and before learning how to combine such sounds into words, mankind had to apportion them with meanings. And it will remain so forever and ever. The chain of intelligent sounds extending from the past is a musical tradition. At times traditions and innovations clash - or custodians sweep away any new developments, or the innovators are destructive and meddle with the body of the tradition. Neither of these ways bear any fruit. The destruction of tradition is pernicious because, by the very nature of this process, the future of a culture is threatened. On the other hand, it is impossible just to preserve a tradition. Despite its apparent conservatism and closeness, the living tradition feeds its juices into today's ready-made environment, thus keeping things vital and alive and not just basing itself on sounds flowing from the past. The living tradition is always in motion - from birth to death and from death to revival. Actuality is repliaced by oblivion, and oblivion is replaced by curiosity. Located in the center of Asia, in the south of Siberia, on the northern border of Mongolia, surrounded by mountains - the Sayan mountains in the north and east and the Altai mountains in the south and west. Cut off from the rest of the world by mountains, it has been the generator of its own history, as can be seen both in the Tuvinian way of life through the many generations, or when comparin gthe cycles of births and deaths, an uneasy people over the centuries. The Huns have been here and mixed with the local tribes in the second century B.C. In the beginning of the presend era, Tuvinian tribes lived under the political influence of the janbimans, and later the gogann (ouon). In the sixth and seventh centuries, Tuva was part of the ancient Turkhish kaganat, and in the eigth and ninth centuries, the Ugrian kaganat. In the ninth and twelfth centuries, Tuva became the state of ancient kyrghyz, and in the twelfth and sixteenth centuries it was under the rule of the Mongolian feudal lords. In the seventeenth and first half of the eighteenth centuries, Tuva was a part of the states Attynkhan and Dzungar. From the middle of the eighteenth century prior to the beginning of the twentieth century, Tuva was part of the Manchu Chinese empire. Tuva was formally an independent state from 1921 until 1944, under the protection of the Soviet Union. In 1944, since the end of the political games of the Stalin regime, and before disintegration of the Union in 1991, Tuva was a small and rightful part of the USSR. Since 1991 Tuva has become one of the Russian republics. The history of Tuva has been enriched by events and newcomers and it has been absorbed a variety of influences from many foreign cultures. Tuva always was an historical and geographical cross-road of cultures. And the Tuvinian nomadic way of life promoted the dissemination and reciprocal penetration of other cultural traditions. The richness of Tuvinian culture under such conditions is thus quite normal and easily explained. What, however, is difficult to understand is just how, from this patch-work quilt od nomadic culture, such an organic and complete blend with such unique components, for example throat-singing, has come about. Tuvinians are nomads and even now are living in their yurts (a kind of tent made from skins, and felt) in the steppes together with their herds of goats, sheep, horses, yaks and camels. This small nation totals about three hundred thousand people. Tuvinians profess to the Lama's branch of Buddhism, but Buddhism on Tuvinian ground closely interlaces with a much more ancient shamanism. In Soviet times, even the smalles national minorities ruthlessly yet amicably built a 'light communistic future' with both religious and traditional cultures, and a future for which they successfully struggled. Of the serveral tens of BUddhist temples and monasteries existent in Soviet times, not one has survived, and only after 1991 are they starting to occur again in Tuva. Shamans were tracked down, and perished in concentration camps and prisons. They concealed their special gifts. It is wise to keep tradition up in mountains; but keeping it in isolation means almost certain extermination. Through fifty years or more of the 'construction of communism', the Tuvinian people could have lost their identity. But, as luck would have it, because laws are so deeply embedded within a culture, 'the Manuscripts do not burn' - as formulated by Russian writer Mikhail Bulgakov. And the tradition of the Tuvinian culture, which was left for decades below ground, has now returned. This return is both holy and gentle, but the way back to the roots is hard and fraught with danger. Tuva was never a reservation. The flow of live always interfered with any artificial and speculative social and cultural constructions. And to go back to tradition does not mean blindly to copy it. Each master had and has his own version of an ancient melody. Even if the tradition is not wholly open, it is certainly slightly ajar. And the real art is - to be within the tradition but to remain yourself. The Siberian people have a custom to present an infant at birth with his own 'personal song', which accompanies him throughout his life and is, in a way, his musical identification. We are almost compelled to combine traditions, because we are living in a 'combined' world, a world assembled from the traditional and the industrial. These combinations are quaint and intricate at times. The capital of Tuva, Kyzyl, is a city with a complex of government buildings, theatres, colleges, supermarkets, concrete non-storey blocks of flats, an airport, regular buses .... But ... in the evening in this city it is so quiet, that the only thing that is audible is the noise of the river, always only just a couple of hundred meters away from you. It is a city, but a city finding its own nature ... 'A sign of civilisation', the only one in the city, is the decent hotel where the foreigners and visitors from the 'centre' usually stop. It is located directly opposite the local branch of the KGB, so that it was not necessary for the secret police to put in much of an effort; on the way from the airport, on the top of one of the buildings, the huge letters of the slogan, preserved from Soviet times, with the old 'truth', removed, it is now well appreciated, instead of the usual 'the People and the Party are together', you see 'the People is together' with blanks - superflous letters have simply been taken down, it is economical and ideologically correct reflecting the actual patriotic spirit. In 1988 a new theatre was founded in Kyzyl. It was created by Resh Milojan - Armenian artist, poet, musician and theatre director, living in Tuva, married fifteen years to a Tuvinian actress. The theatre is referred to as the 'Kyzel', which means 'dream' in Tuvinian. The theatre was constructed as a modern building, a picturesque version of traditional rituals and mysteries. Basically Tuvinian in style, but not exclusively. It was the poetic version of the existence of shamanism, now in the forms and frameworks of art. 1990 - By arrangement with the theatre, under the direction of Vresh Milojan, the musical group 'Biosintes' was born. At the beginning, the basic function was the creation of recordings for and the participation in the performances taking place at the 'Kyzel' theatre. Primarily Tuvinian, Armenian and Russian musicians with very diverse backgrounds - one musician originally played in folklore groups, someone else played in restaurants, another in pop groups. They all played in the group. Primarily the music of the group was orientated around an ethnic type of improvisation, sometimes constructed on a rock ostinato, sometimes completely free. But a major inspiration was Tuvinian throat-singing, and first of all, slow songs. 1991 - Moving away from the theatre, the touril lfe of 'Biosintes' begins. And after its first appearance on festivals, the group came to the attention of the public, critics and promoters. 1991 - 1994 - the group actively and successfully performed on festivals and played concerts in Kyzyl Yakutsk, Krasanojarsk, St. Petersburg and Moscow. Its material constantly varied. It shrank from seven members to three, enlarged itself again by the addition of invited guest musicians. In 1994 - besides sensational performances in St. Petersburg and Moscow, 'Biosintes' opened itself for Europe and opened itself to Europe, making a month long tour of Germany and Austria together with fellow countrywoman Sainkho Namtchylak, already well known in the world of new improvised music. This tour ended with a performance of Berlin's 'Total Music Meeting' Festival, (the recording of which you are holding in your hands at this moment). 1995 - 1996 - the group has occasionally performed on Russian festivals, and has once again changed its material and now has again returned to the place of its birth, the theatre, which in the last years has moved over to Moscow. The circle has closed. This was the brief history of 'Biosintes'. But in parallel with its history (however, rather frequently criss-crossing it - almost Lobachevsky' geometry), there was another history - the history of contacts and interaction of the new improvising music with Tuva, the Tuva public, Tuvinian musicians and Tuvinian music. Here it is (again in telegrammatic style). 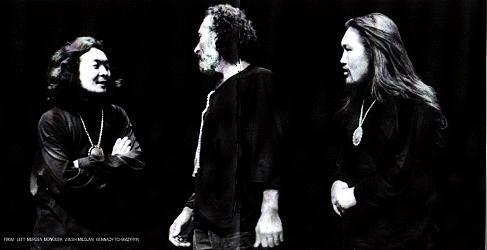 In 1988 Sainkho Namtchylak - known at that time not only in Tuva and Russia, but also in many other countries, the folklore singer, turned form the camp of old (and not so old) Improvised music to the camp of new music largely improvised. Thus her dizzy career began. In the subsequent years she infrequently (once or twice a year) visited her native land and gave the occasional concert for her fellow-countrymen. In 1991 Peter Kowald - free jazz missionary - appeared in Tuva with the comrades. He gave a concert in Kyzyl, communicated with musicians, showed hisart and closely and attentive got acquainted with Tuvinian art. 1991 - 1994 - Ken Hyder, Tim Hodgkinson and Vladimir Miller from Britain, Heinz-Erich Gödecke and Hans Schüttler from Germany, Austrian 'Die Knödel' occasionally came to concerts and workshops in Tuva. All these visits were organised or inspired by Sainkho. 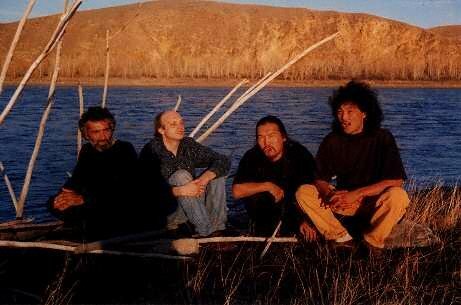 1994 - a remarkable workshop and concert of British and Tuvinian musicians, including the group 'Biosintes', and serveral authentic shamans was held in Kyzyl. 1995 - 1996 - No concerts of New Jazz have taken place in Tuva in this period. You should try putting these two chronologies together yourself. published here with special permission from Nick Dmitriev. on November 18, 1994 at the 'Podewil' in Berlin.